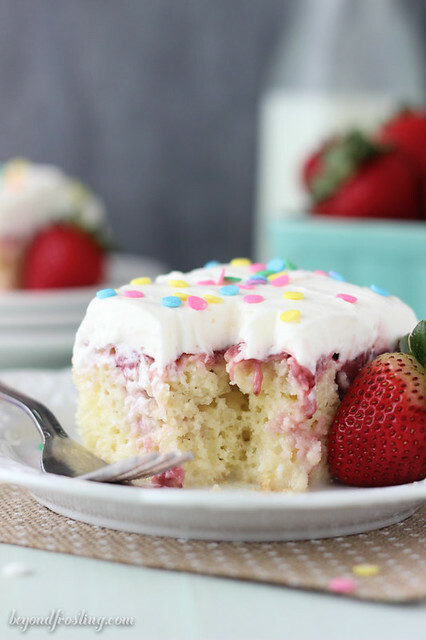 This Strawberry Cheesecake Poke cake is similar to a tres leches cake. 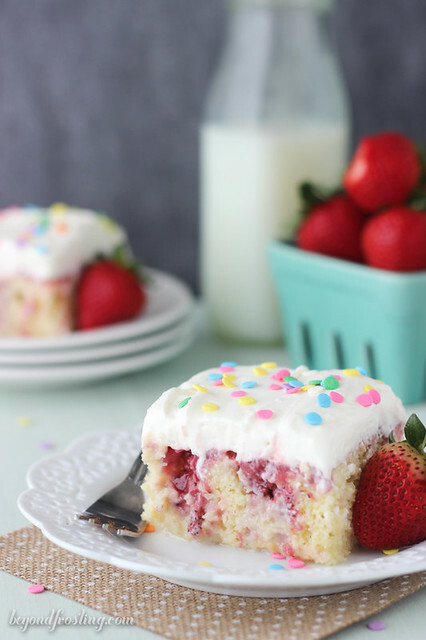 The vanilla cake is filled with sweetened condensed milk and it’s topped with a fresh strawberry sauce and cream cheese whipped cream. Whew! I just returned home from a weekend in Portland that I just cannot wait to tell you guys about. This trip was something I have been looking forward to for quite a bit of time. My boyfriend and I have been trying to coordinate a trip to Portland for the past couple of years so we can go snowboarding, but with the lack of winter this year, it just didn’t happen. I attended a conference on Saturday and was able to spend all my free time exploring and eating my way through the city, but more on that later. Flash forward to 2016 and we’re living in Portland, how funny is that? 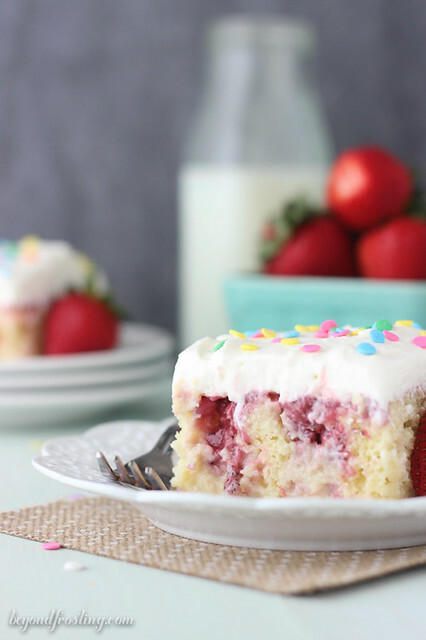 Today, let’s talk about this Strawberry Cheesecake Poke Cake. I have three words to describe this dessert. O-H M-Y G-O-D. When I set out to make this dessert, I knew I wanted a mix of a shortcake with fresh strawberries most importantly, a cream cheese whipped cream. The topping is a serious bonus on this cake. 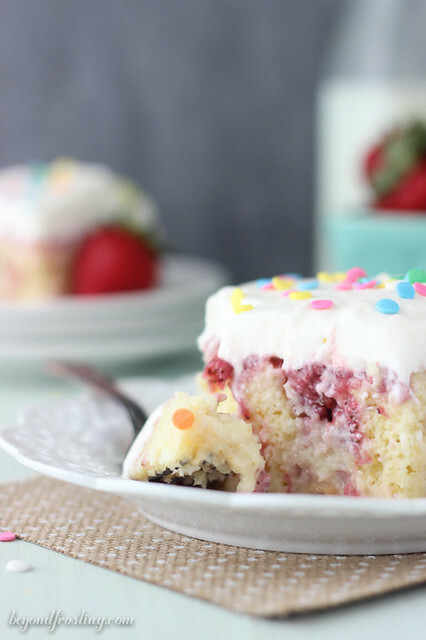 If you have never made a poke cake, you are in for a real treat with this dessert (no pun intended). A poke cake is a cake that you bake, and then poke holes all over the top, then drizzle some type of liquid over it like pudding, sweetened condensed milk, caramel; you get the idea. 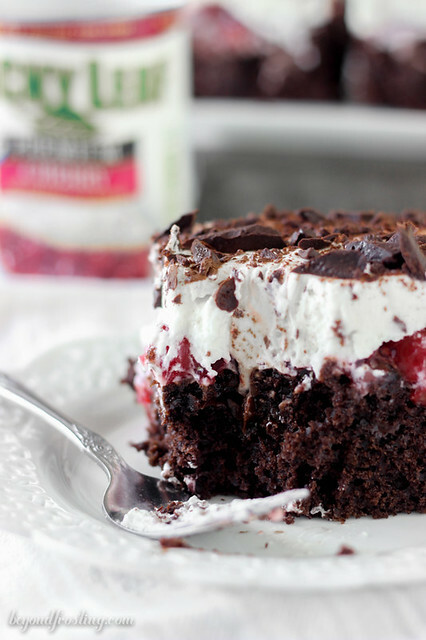 Then you finish it with some whipped cream and your favorite topping like fruit or candy. 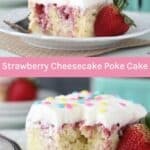 I have a big collection of poke cakes, so be sure to checking out my collection of more than 15 irresistible poke cakes or you can just search “Poke Cake” in my sidebar. For ease, I used a vanilla cake mix but if you’d like a homemade cake, I definitely suggest my homemade moist vanilla cake. 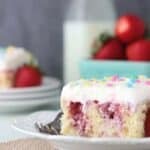 This cake has a can of sweetened condensed milk poured over the top. I’m not really sorry about that either. One of my friends who tried this cake asked me if it was a tres leches cake. This is a total win in my book because I LOVE tres leches! For the topping, I made a strawberry sauce using fresh strawberries, It’s mixed with a little lemon juice and some sugar. It’s a basic sauce that I poured over top after I added the sweetened condensed milk. After all that, I topped this cake with what I like the call, “the best thing ever”. It is a cream cheese whipped cream that is so versatile. I have used it to top cupcakes, cakes and even for a filling. The key to making the cream cheese whipped cream is to start with a softened cream cheese and then whip the heck out of it until it is super smooth and creamy, otherwise you will end up with a lumping topping. The second important part is to add the heavy whipping cream slowly to incorporate it into the cream cheese. 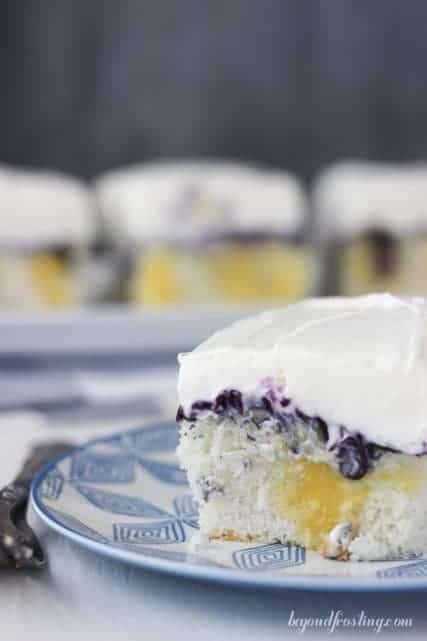 Since you are adding a whipped cream topping to this cake, it is important that the cake is completely cooled before you spread it on. Usually I will bake the cake, let is cool for 15 minutes, fill it with the milk, and strawberry sauce, then pop it in the refrigerator to help it cool. I add the whipped cream last and then it has to be kept refrigerated. This recipe is very versatile. 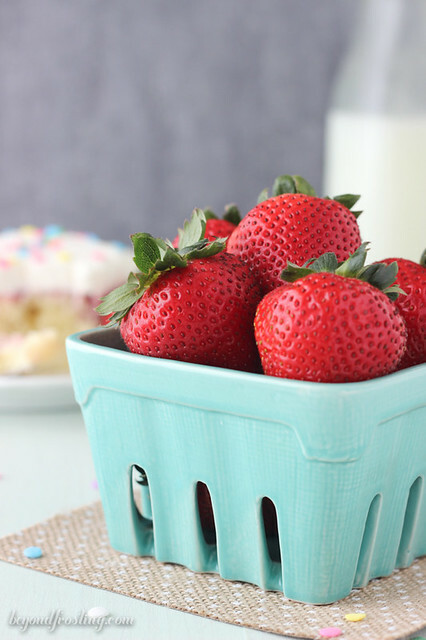 If you don’t love strawberries, try substituting your favorite fruit like blueberries, raspberries or even peaches! This is a great summer dessert for your potluck and BBQs! Combine cake mix according to the ingredients on the box. Beat on medium speed until well combined. 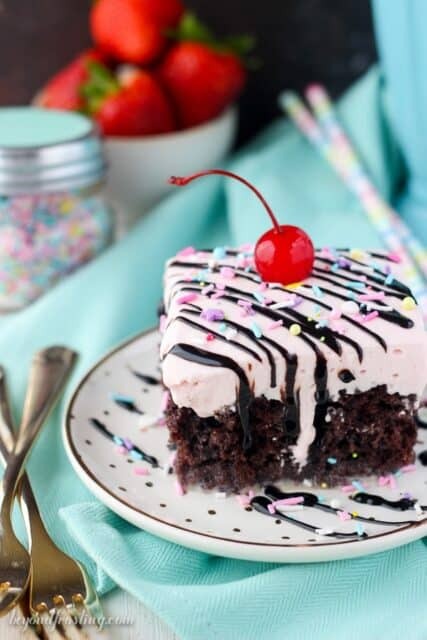 Bake cake in 9×13” for 20-22 minutes. Check for doneness by inserting a toothpick into the middle of the cake. If the toothpick comes out clean, you cake is done. Allow to cool for 10 minutes. While the cake is still warm, take the end of a wooden spoon or another round object and poke holes all over the top of your cake. Pour the can of sweetened condensed milk all over top of the cake. To prepare the strawberry sauce, rinse the strawberries and cut of the stems. Chop into quarters. In a medium-sized sauce pan, combine strawberries, water, sugar, lemon juice and flour; stir well. Cook over medium-high heat until mixture starts to boil and strawberries are softened. Gently smash strawberries to create a sauce. Allow to cool for 15 minutes. 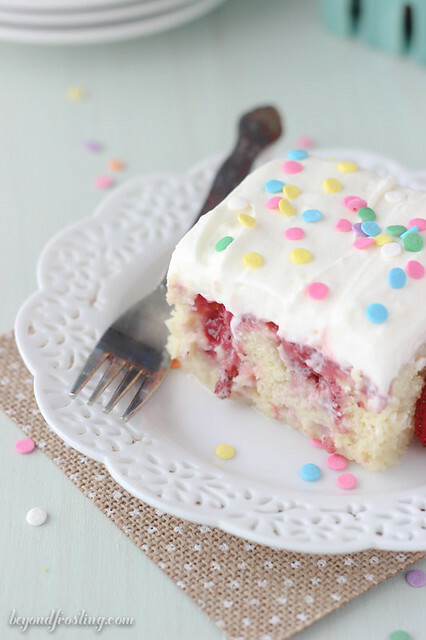 Pour strawberries sauce over top of the cake and refrigerate until cake and toppings are cooled. Remove the cream cheese from the refrigerator 15-20 minutes before preparing the whipped topping. At the same time, put your mixing bowl and wire whisk in the freezer to help it get very cold. This is optional, but something I usually do. Add 3 tablespoons of heavy whipping cream. Beat into cream cheese until cream cheese resembles a liquid mixture. Add remaining heavy whipping cream and beat on medium-high speed. Slowly added remaining powdered sugar and beat until still peaks form. Spread over cooled cake. This cake must be refrigerated. It looks delicious . I’m wondering if it would be ok refrigerated 2 days before serving? Hi DeeDee, yes! But I would probably make the topping the day of serving for the best results. It will definitely keep in the fridge, but this is what I prefer to do.